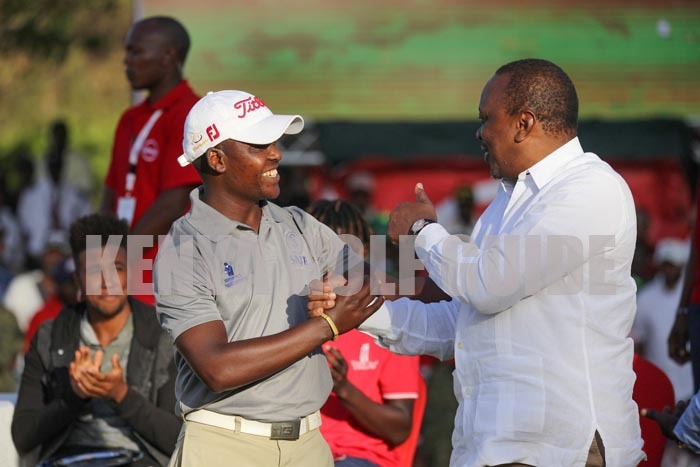 President Uhuru Kenyatta congfratulates Kenya’s top pro at the 2019 Magical Kenya Golf Championship, Simon ngige, who finished tied in 25th. He took home Kshs 1.2 million for his efforts. A superb birdie chip off the edge of the 18th green saw Thika Golf Club’s Simon Ngige end his 2019 Magical Kenya Open Golf Championship campaign with a round of 69 for a tournament total of 5-under 279 to see him finish tied in 25th. He added: “I am going to Zambia in a week for the Zambia Open then the Zimbabwe Open. I am driving well off the tee and I just need to practice on the green from Wednesday. This was his best-ever finish at the Kenya Open Golf Championship for which he took home € 10,615 (equivalent to KShs 1.2 million). This entry was posted on Monday, March 18th, 2019 at 2:55 PM and is filed under Golf News. You can follow any responses to this entry through the RSS 2.0 feed. Both comments and pings are currently closed.